Europeans raced across oceans and continents during the Age of Exploration in search of territory and riches. But when they reached the South Pacific, they found they had been beaten there by a more humble traveler: the sweet potato. Now, a new study suggests that the plant's genetics may be the key to unraveling another great age of exploration, one that predated European expansion by several hundred years and remains an anthropological enigma. Humans domesticated the sweet potato in the Peruvian highlands about 8000 years ago, and previous generations of scholars believed that Spanish and Portuguese explorers introduced the crop to Southeast Asia and the Pacific beginning in the 16th century. But in recent years, archaeologists and linguists have accumulated evidence supporting another hypothesis: Premodern Polynesian sailors navigated their sophisticated ships all the way to the west coast of South America and brought the sweet potato back home with them. The oldest carbonized sample of the crop found by archaeologists in the Pacific dates to about 1000 C.E.—nearly 500 years before Columbus's first voyage. What's more, the word for "sweet potato" in many Polynesian languages closely resembles the Quechua word for the plant. Studying the genetic lineage of the sweet potato directly has proved difficult, however. 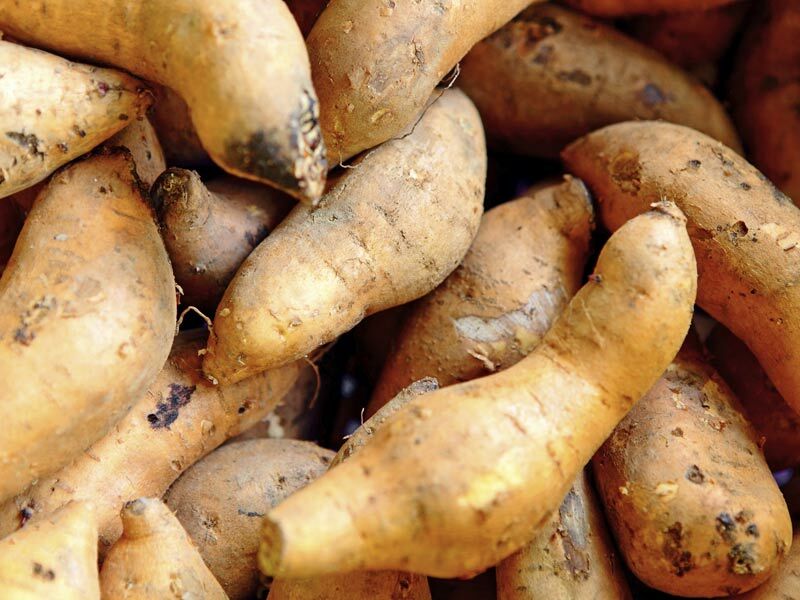 European traders exported varieties of sweet potato from Mexico and the Caribbean to the Pacific, and those breeds mixed with the older Polynesian varieties, obscuring their genetic history. Therefore, it's difficult to apply information culled from modern samples to older varieties without a prehistoric control. Now a team of researchers working with France's Centre of Evolutionary and Functional Ecology and CIRAD, a French agricultural research and development center, has identified one such temporal control: sweet potato samples preserved in herbariums assembled by the first European explorers to visit many Polynesian islands. The study, which is published online today in the Proceedings of the National Academy of Sciences, provides strong evidence for prehistoric contact between Polynesia and South America. The decision to analyze herbarium specimens is "innovative" and provides another piece of strong evidence for the tripartite hypothesis, says archaeologist Patrick Kirch, of the University of California, Berkeley, who was not involved in the study. Lead author Caroline Roullier emphasizes that although her genetic analysis alone doesn't prove that premodern Polynesians made contact with South America, it strongly supports the existing archaeological and linguistic evidence pointing to that conclusion. "It's the combination of all different kinds of proof" that's really convincing, she says. Anthropologist Richard Scaglion of the University of Pittsburgh in Pennsylvania agrees, "All the lines of evidence coming together … really strengthens the case" for Polynesian contact with South America.